Nicolas Sarkozy has yet to complete a full year in office as French President, and yet he’s generated much media copy from French tabloids keeping tabs on his recent divorce and wooing of singer/songwriter, former model, and Italian, Carla Bruni, to The Economist watching his moves closely as he battles the intransigent poverty and rapidly approaching problem of Baby Boomer-age retirement. 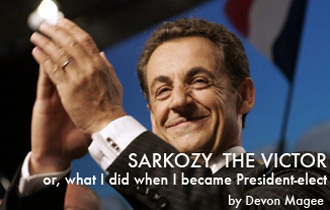 Devon Magee brings his insight back to Fanzine with his second piece on Sarkozy. Nicolas Sarkozy emerged victorious after the second round of the French Presidential election. A thousand cars burned in the aftermath, which, according to who is reporting, may or may not be related to his win. Regardless, France is watching, waiting, and anticipating something come May 16, when Sarkozy officially takes office. Devon Magee reports on the scene from France. Part two of the French Elections series.